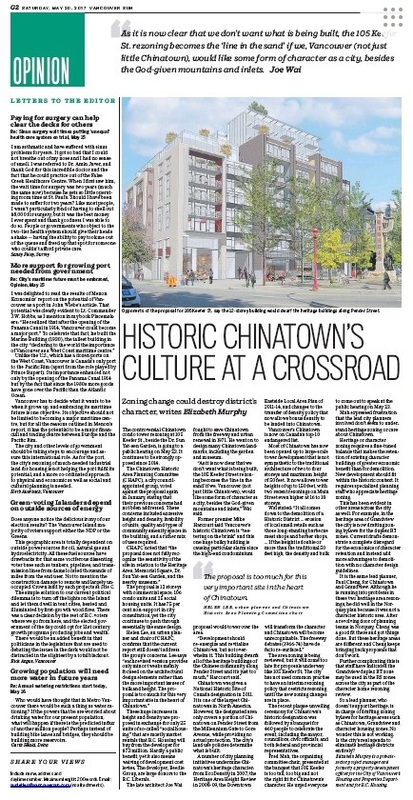 Historic Chinatown becoming Yaletown North? The controversial Chinatown condo tower rezoning at 105 Keefer St., beside the Dr. Sun Yat-sen Garden, is going to a public hearing on May 23. It continues to be strongly opposed since 2014. 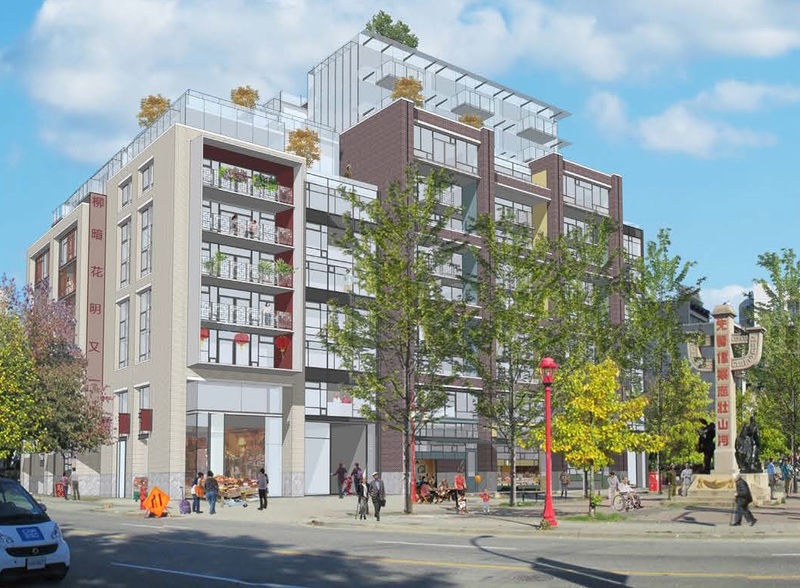 The Chinatown Historic Area Planning Committee (CHAPC), a city council-appointed group, voted against the proposal again in January, stating that their previous concerns had not been addressed. These concerns included excessive height and density, livability of units, quality and types of community amenity spaces in the building, and a richer mix of uses required. The proposal is 12 storeys with commercial space, 106 condo units and 25 social housing units. It has 75 per cent non-support in city consultation, yet the city continues to push through essentially the same design. These huge increases in height and density are proposed in exchange for only 25 units of so-called “social housing” that are in fact mostly market rentals that B.C. Housing will buy from the developer for $7.3 million. Hardly a public benefit, yet it also means waiving of development cost levies. The developer, Beedie Group, are large donors to the B.C. Liberals. The late architect Joe Wai fought to save Chinatown from the freeway and urban renewal in 1971. He went on to design many Chinatown landmarks, including the garden and museum. “As it is now clear that we don’t want what is being built, the 105 Keefer Street rezoning becomes the ‘line in the sand’ if we, Vancouver (not just little Chinatown), would like some form of character as a city, besides the God-given mountains and inlets,” Wai said. Former premier Mike Harcourt said Vancouver’s historic Chinatown is “teetering on the brink” and this one huge bulky building is causing particular alarm since the high-end condominium proposal would tower over the area. Chinatown was given a National Historic Site of Canada designation in 2011. It is one of the largest Chinatowns in North America. However, the designated area only covers a portion of Chinatown on Pender Street from the Millennium Gate to Gore Ave. while providing no actual protection. The city’s land use policies determine what is built. A number of city planning initiatives undermine Chinatown’s heritage character: from EcoDensity in 2007, the Heritage Area Height Review in 2008-09, the Downtown Eastside Local Area Plan of 2011-14, and changes to the transfer of density policy that now allows bonus density to be landed into Chinatown. Vancouver’s Chinatown is now on Canada’s top-10 endangered list. The area zoning is being reviewed, but it will come too late for current proposals underway like 105 Keefer Street. The city has not used common practise to have an interim rezoning policy that restricts rezoning until the new zoning changes are in place. The recent plaque-unveiling ceremony for Chinatown’s historic designation was followed by a banquet for 460 people to celebrate the event, including the Mayor, councillors, civic officials, and both federal and provincial representatives. Fred Mah, the organizing committee chair, presented at the banquet that 105 Keefer is too tall, too big and not the right fit for Chinatown’s character. He urged everyone to come out to speak at the public hearing on May 23. Mah expressed frustration that the lead city planners involved don’t seem to understand heritage zoning or care about Chinatown. Heritage or character zoning requires a fine-tuned balance that makes the retention of existing character buildings of greater economic benefit than for demolition. New development should fit within the historic context. It requires specialized planning staff who appreciate heritage zoning. This has been evident in other areas across the city as well. For example, in the heritage area of Grandview the city is now drafting zoning bylaws for the duplex RT zones. Current drafts demonstrate a complete disregard for the economics of character retention and instead add more advantages to demolition with no character design guidelines. It is the same lead planner, Paul Cheng, for Chinatown and Grandview. Although he is running into problems in these two heritage area rezonings, he did well in the Norquay plan because it was not a character historic area. After a revolving door of planning teams in Norquay, Cheng was a good fit there and got things done. But these heritage areas are different and Cheng keeps bringing back proposals that don’t work. Further complicating this is that staff have indicated that the Grandview duplex RT zone may be used in the RS zones across the city as part of the character home rezoning review. So a lead planner, who doesn’t support heritage, is in charge of drafting zoning bylaws for heritage areas such as Chinatown, Grandview and character housing zones. No wonder this is not working. Is the city’s real agenda to eliminate heritage districts entirely?